Chicago does it best around St. Patrick’s Day to show its Irish connections. It may be less “Irish” statistically than Boston, New York, and Philadelphia – but you would never know that if you were in the Windy City this past weekend, March 16017, 2019. The Irish Parade toddled down Michigan Avenue on Saturday. And the Southside Irish Parade celebrated all things Irish on Sunday. Why two parades? Well…there is some debate as to which part of Chicago is most Irish, the north or the south. It is a little like Cubs vs. Sox. Chicago has a long tradition of Irish politicians, firemen, and policemen, although less so today than half a century ago. And, yes, the city really dyes the Chicago River green for St. Patrick’s Day. It seems that even in today’s secular culture, there remain a good number of men willing to forgo (or at least postpone) green beer for uplifting spiritual talks, prayer, confession, adoration, and mass — all a part of the day. The event was sponsored by Regnum Christi, Lumen Institute, the Knights of Columbus, and Relevant Radio. 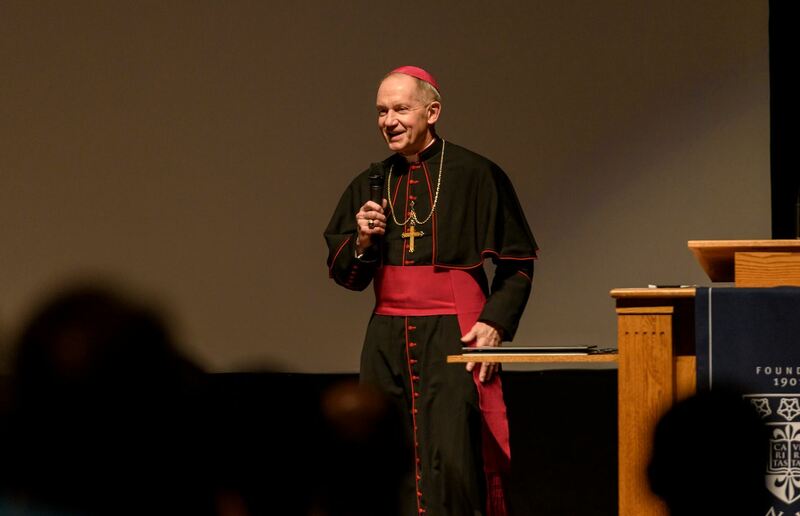 Among the featured speakers was Bishop Thomas Paprocki of Springfield, Illinois. He was ordained a priest for the Archdiocese of Chicago in 1978. After ordination, he studied law at DePaul University College of Law and was admitted to the Illinois Bar in 1981. Working as a parish priest at St. Michael Church in South Chicago, a neighborhood with high unemployment due to shutdowns of the local steel mills, then-Father Paprocki co‑founded the South Chicago Legal Clinic to help answer the need for legal services for the poor. In 2014 Bishop Paprocki was named President Emeritus and Of Counsel of the organization, now called the Chicago Legal Clinic. He went on to become an auxiliary bishop in Chicago before moving to Springfield in 2010. In addition to English, he speaks Polish, Spanish and Italian, and he reads Latin. He enjoys running and he plays ice hockey, which he explained has led to some interesting opportunities to share the faith. At the seminary in Mundelein, Illinois he learned to ice skate and became a goalie in master’s leagues. When he moved to Springfield, a parent at the high school asked him to talk to the members of the local Catholic high school hockey club. One thing led to another and Bishop Paprocki has become the team’s goalie coach and serves as practice goalie. Of course, with a bishop working with a hockey team, he brings the sacraments. So the bishop has rosary and mass with the team. Not all the hockey players are Catholic, which can lead to opportunities to share the faith. One year for Christmas, the team had dinner and Bishop Paprocki gave each member a rosary. A few weeks later after a game, one of the non-Catholic players approached the bishop and asked if he would teach him how to pray the rosary. A player got to the rosary via hockey. And hockey practices with a bishop present has another unexpected benefit: confession. When Bishop Paprocki isn’t in the nets as the goalie, he will take a seat in the “penalty box” and hear confessions. It might be a unique situation in which a hockey player goes to the penalty box to have his sins forgiven rather than to be punished for bad behavior on the ice. As evidence of his ability to connect hockey and the Catholic faith, Bishop Paprocki even wrote a book on the subject: Holy Goals for Body and Soul: Eight Steps to Connect Sports with God and Faith. His mother (who passed away a week ago) had not been baptized as a baby. When she was 13, she took her younger brother, 9, and the two went to the parish rectory and asked to be baptized. Why did she want to be baptized? So she could go to confession, the bishop explained. Her best friend would go every Saturday and the bishop’s mom — not being baptized — couldn’t participate. “My mom is the only person I know who asked to be baptized so they could go to confession,” Bishop Paprocki said. Bishop Paprocki also stressed that action on behalf of justice and on behalf of the poor is an essential part of the faith – and core to his vocation as a priest. That means not simply talking about issues; it means actually doing something. Richard Lane, Jr. – After converting to the faith on April 19, 2003, it was in early 2005 when Mr. Lane was lead to begin proclaiming the Gospel as a street corner evangelist, sharing the Word of God, passing out Bibles, crosses and other religious items. Since that time Mr. Lane has been featured on “Catholic Answers Live”, Ave Maria Radio, Relevant Radio, Our Sunday Visitor, the National Catholic Reporter, Sports Review Magazine, as well as Eternal Word Television Network’s (EWTN) the “Journey Home”. He is also the Co-Founder of Catholic Men for Christ Men’s Conference in St. Louis, Missouri which continues to draw thousands of men each year to hear the Powerful Message of the Gospel. Maryanne Miller – Four Star General Maryanne Miller is the Commander of Air Mobility Command, Scott Air Force Base, Illinois responsible for providing airlift, air refueling, aeromedical evacuation, and mobility support to enable rapid global mobility and sustainment of America’s armed forces around the globe. In her free time, she volunteers with the Missionaries of Charity serving the poorest of the poor. She has traveled to Calcutta India to serve in the many houses started by Saint Mother Teresa and has worked with the sisters for over 5 years. Fr. Richard Simon – Father Richard Simon is the pastor of St. Lambert’s Parish in Skokie, IL. His expertise is in apologetics with a concentration on the early Christian Church. Fr. Simon attended St Francis Xavier grade school, Quigley Seminary, and received his Bachelors from Loyola University in Chicago, majoring in classical Greek. His graduate studies were at the University of St. Mary of the Lake, where he received a Masters of Divinity and a Bachelors in Sacred Theology. Since 1982, he has taught classical Greek and Latin at St Joseph’s College, formerly Niles College, the undergraduate or college seminary for the Archdiocese of Chicago. In 2013, he transitioned from his position as a co-host on the popular Relevant Radio program Go Ask Your Father™ to the host of his own show Father Simon Says™. Chris Stewart – Chris Stewart is a loving husband, father, and dynamic speaker who has engaged youth and adults with captivating talks for 20 years. He and his beautiful wife, Maria, have been married for 16 years, are blessed with seven children, and live in Wichita, Kansas. Chris’ experience with youth, family life and death, and his ability to connect with his audience no matter what age or walk of life, has made him a sought out speaker for years.